Discussion in 'PowerPC Macs' started by 128keaton, Dec 1, 2014. I thought it would be nice to keep all of the crappy craigslist ads in one spot. These would preferably be Apple or IT related in someway. This one is not too bad, but a smidgen over priced. I read the price on the mouse as $15, not $50. Not a bad price, as I've paid similar for(used) ones on Ebay, and that one appears to be new. Hot damn, oops I thought it said $50. I do live in Memphis, it could really be the latter. If the guy really doesn't know much about it, that could be the case. There are signs of something being stolen or having been found, esp. if someone is selling a laptop. Usually, if it does not include a power adapter, it was probably stolen. 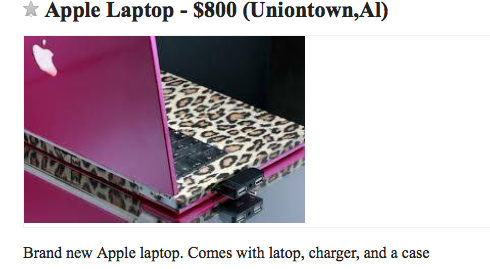 I can understand if a person lost theirs while the laptop was floating around, unused, but that is a red flag right there. iMac G4s regularly go for over £100 on eBay, so the first one is not outrageous by any means, particularly as keyboard and mouse are included. Those Pro keyboards fetch £15+ alone in good condition. 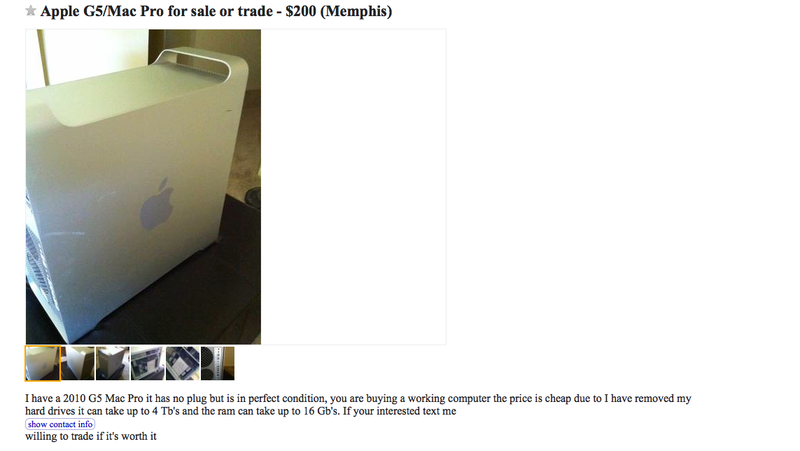 The G5 is a Mac Pro G5 and therefore EXTREMELY rare. You should snap that up. Not many made in 2010. I wish the PowerBook was decently priced, I'd snap that up in a heartbeat. Give it a few months and you will be paying the asking price just for the hard drive the way things are going. People on Craigslist regularly pay higher prices all the time...this is not that unusual. I got my iBook for $37.99, lol. Plus $10 for an AC adapter, but still. By the way, a local antique shop has a TRS-80 Model III(what the one in the listing appears to be, unless it's a IV) for $250 or so. It also hasn't moved in at least 6 months, so I'm not sure if that's necessarily an accurate marker of current market price. I haven't kept up with current Ebay prices, but it wouldn't surprise me if $100 isn't too out of line considering what it would cost to ship one of the beasts. Of course, most of them haven't been sitting in a back yard covered in a tarp . I wouldn't put a lot of faith in the one in the ad working unless some serious work were done on it. I've wanted a TRS-80 since I first played with one that a friend's dad had used and retired. His started life as an all-original Model I with 4kb of RAM and no numeric keypad, but had been upgraded to 16kb and the numeric keypad. He had the original monitor, cassette player, plus the expansion unit with an additional 32kb RAM as well as two floppy disk drives, a printer, and a modem to attach to it. All in all, it was a pretty slick set up for a TRS-80 model I, although we needed his dad's index card with the power up instructions to get everything working correctly and talking to everything else. Wow, thats pretty incredible. Sounds like a similar upgrade pattern of my dad's IBM home machine back in the 80s. It ran DOS for a while, but was upgraded to Windows 3.1 eventually. It received memory upgrades to handle certain tasks, and even went through TWO VGA cards. It ran Win 95 pretty damn well, considering it was bought as a DOS machine. My dad sort of went through a similar upgrade path as well. He ran a tax business from home, and bought a Tandy 1000a in 1985. It had a screaming 8mhz(I think) 8088 processor, a single 5 1/4" disk drive, and 128K of RAM. He pretty quickly added a second disk drive(I think the day after he bought the computer, as per his story) and shortly thereafter upgraded it to a full 640K of RAM. Later upgrades included an internal modem(necessary for electronically filing tax returns), a parallel port to connect a Laser printer(he also had a Tandy printer for the proprietary printer port), and a 30mb hard drive on an expansion card. All in all it wasn't a bad computer for its day. "because I payed $650 for it" Yeah, six years ago! But it's rare! Did you notice it's an iMac G4 with a 19.5" display. It's one of a kind! You'd think they would do some research before posting, and take their own pics, pretty obvious when a low res stock picture is used, kills their credibility instantly. I even found the same photo floating around on MacRumors. I just hope there is no one out there dumb enough to buy it. A lot of common folk are not educated well enough to make PC purchases, let alone a Mac purchase. Who knows what he or she meant to say instead of "apple go computer." Drugs are bad, kids. I love when sellers include their original purchase price in listings. It isn't the buyer's responsibility to ensure you get a good return on your investment. Thats a bit steep for an iBook. More iHook than iBook. Literally pimped out. Not Craig's list, but I was in a pawnshop yesterday and saw a PowerBook G4 (17"?) in reasonable condition, but they were asking $335 for it. No amount of haggling can get it down to a feasible price. To be fair the TiBook is boxed and complete with all the accessories. £220 is a tad steep though even for a collector.